Bring any table, desk or stand to life with our exclusive 12 inch mini tabletop screens. 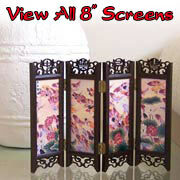 All of our mini screens feature two popular and separate Asian-themed designs, one on the front and one on the back. Crafted from four distinct panels, each side tells a story using a breath-taking printed design reminiscent of the beauty and nature found in Asia. 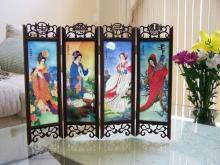 These 12 inch miniature screens are marvelous decorative/conversation pieces and look great against a wall, or out in the open, where both sides can be viewed. See our complete selection below and choose from a wide variety of motifs and colors. 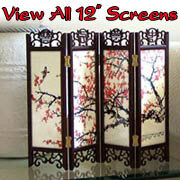 We are sure you will find the perfect miniature screen for your home of office right here. Four Chinese muses each in their own colorful dress proudly display their wares in this dramatic and captivating work. A muse is a guiding spirit or source of inspiration. Each panel exhibits a separate muse in one of the four seasons.